This interesting Contextual Image (or "CTX Frame", for short) of the Dwarf Planet 1-Ceres, taken by the NASA - Dawn Spacecraft on October, 15, 2015, shows us a small part of its Southern Hemisphere. In this view, two prominent, similarly sized and both Unnamed Impact Craters (left - Sx - of the frame) demonstrate how the so-called "Impact Features" become degraded over time (---> a LONG time, of course...). The leftmost of the pair is younger: in fact, its Rim is crisp and its Walls are generally smooth, peppered with only a few small Craters. 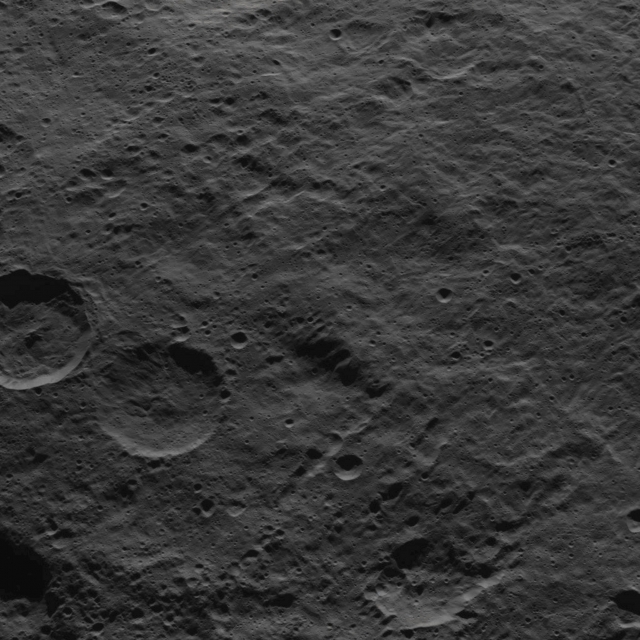 On the other hand, its older twin, to its right (Dx), has been battered by more Impacts, and the Material around its Rim has slumped and softened. In fact, the Blanket of Material ejected from the younger Impact Crater (---> such as the so-called "Ejecta Blanket"), during its formation, would have partly covered its older neighbor. Planetary Scientists call this slow, progressive changing of the Surface of Planetary Bodies by Cratering, as "Impact Gardening". This image (which is an Original NASA - Dawn Spacecraft's b/w and NON Map-Projected frame published on the NASA - Planetary Photojournal with the ID n. PIA 20135 - Dawn HAMO Image 72) has been additionally processed, extra-magnified to aid the visibility of the details, contrast enhanced and sharpened, Gamma corrected and then colorized (according to an educated guess carried out by Dr Paolo C. Fienga-LXTT-IPF) in Absolute Natural Colors (such as the colors that a normal human eye would actually perceive if someone were onboard the NASA - Dawn Spacecraft and then looked ahead, towards the Surface of 1-Ceres), by using an original technique created - and, in time, dramatically improved - by the Lunar Explorer Italia Team.